As you may know, it's not like I mentioned it or anything, last week I went to Glastonbury Festival and have been slightly depressed ever since I got back. 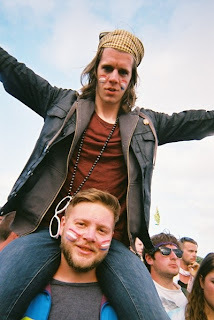 It was the 4th time i've been to Glastonbury and every time it just gets better and better! We were really lucky with the weather, it only rained on one of the days, but to be honest i'm not sure I would care whether it was thunder and lightening i'm just so happy to be there. I went with a big group, there were around 16 of us including my boyfriend, brother, cousins and best friends and I could not have gone with a better group of people, but i'm sure every one says that! As i've mentioned in a previous post I love disposable cameras and of course took a couple to the festival and am so pleased I did because I lost one and the other came out really well! As you can see I wore my floral crown and lots of fake eyelashes which helped with the general awful state my hair and face were in the majority of the time! If you went to Glastonbury i'd love to know if you enjoyed it and if not I hope these photos make you want to go next year! Looks like you had great fun. Most of our office made the mass exodus, it was like a ghost town here!